Prof. Pascal Frossard is Associate Professor in the Electrical Engineering Institute at EPFL and Associate Dean for Research in the School of Engineering. Before joining EPFL in 2003, he was stationed at the IBM TJ Watson Research Center at Yorktown Heights, NY, USA. His core research areas include interpretable machine learning, data science, graph signal processing, image representation and analysis, computer vision and immersive communication systems. His most research contributions include analysis of the geometric properties of deep networks, deep nets robustness analysis, and representation learning for graph signals. Carmela Troncoso has a PHD from KU Leuven, Belgium. Currently, she is a Tenure Track Assistant Professor at EPFL. She leads EPFL’s SPRING Lab, which focuses on Security and Privacy Engineering. Her ongoing researches include machine learning in security and privacy, privacy in crowd sourcing applications, anonymous communications, location privacy, and privacy engineering methodologies. In her past engagements, she has worked as a faculty member at the IMDEA Software Institute in Madrid and Security and Privacy Technical Lead Engineer at Gradiant. She has also conducted post-doctoral research at the COSIC group. Robert West steers the Data Science Lab in his capacity as Assistant Professor in the School of Computer and Communication Sciences at EPFL. He delves into large amounts of data and uses algorithms to work on aspects such as social and information network analysis, machine learning, computational social science, data mining, natural language processing, and human computation. Paolo Ienne heads the Processor Architecture Laboratory (LAP). In the early 1990s, he was an undergraduate researcher at Brunel University, Uxbridge, U.K. Thereafter, he worked as Research Assistant at the Microcomputing Laboratory (LAMI) and at the MANTRA Center for Neuro-Mimetic Systems of EPFL. He joined the Semiconductors Group of Siemens AG, Munich, in December 1996. He has been a professor at EPFL in 2000. Prof. lenne specializes in computer and processor architecture, FPGAs and reconfigurable computing, electronic design automation, and computer arithmetic. 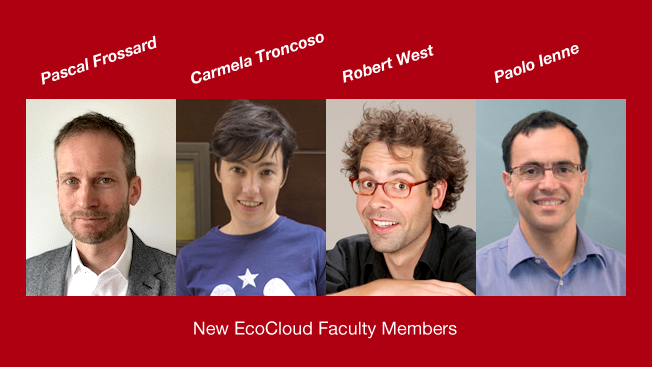 The new members bring their expertise to EcoCloud’s distinguished faculty that already has leading names under its wings. They are expected to jumpstart several new studies and enrich EcoCloud’s research output in the coming years.